Over the past few weeks I have been setting up a new Google account to be used as my central hub for everything Google in my life. My old Google account was fine, it's just that I wanted a more professional user name and a username that more reflected my website. So I opened a new Google account and started investigating ways to transfer my contacts, my Picasa Web Albums and Google calendar over to the new account. A few days ago I wrote a tutorial on how to transfer a Picasa Web Album account to a new Google account, and today I am going to show you how to move a calendar over to a new Google account. 2.) Click on the "Settings" tab. 3.) Under the "Settings" tab select the "Calendars" tab. 4.) Choose the calendar you wish to share, and select the "Share this calendar" link under the "Sharing" heading. 5.) 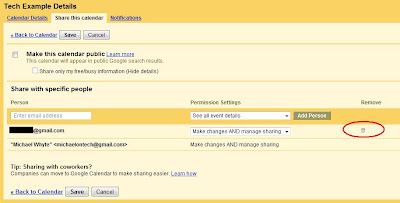 Move down to the "Share with specific people" section and enter the email address of your new Google account. 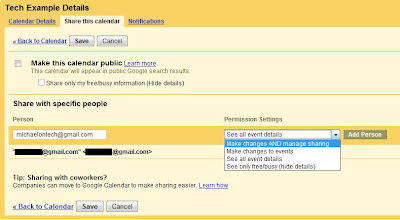 Under the "Permission settings" select "Make changes AND manage sharing" if you want your new Google account to have full administration privilages for this calendar, otherwise choose one of the more restrictive choices. Click "Save" to save your changes. 6.) Logout of your old Google account and login to your new Google account. 7.) If you wish to keep administration access for the calendar with the old account then you are done. Just go to the calendar section of your new Google account and the calendar will have automatically loaded in. If you wish to delete the old Google account from this calendar then you will have to go into your calendar settings in your new Google account, select the Calendars tab and then select the "Shared: Edit Settings" for the new calendar that you just transfered from the old account. 8.) Move down to the "Share with specific people" section and click on the trash can next to your old Google account. That's it, you have now fully transfered your Google calendar to your new Google account. this is exactly what i am looking for! thanks for sharing. Thank you! That is the most helpful thing I have seen all year. Much easier than import/export. doesn't this mean though that my cal in the new account will not be the main but only under shared calendars? Thank you very much. The screen-shots made it very easy. Thank you so much for posting this! I've been trying to figure out how this can be done for such a long time! !